'Chief negotiator' accuses Israel for 'provoking' terror attack from PA 'unity partner' Hamas terrorist in Jerusalem. 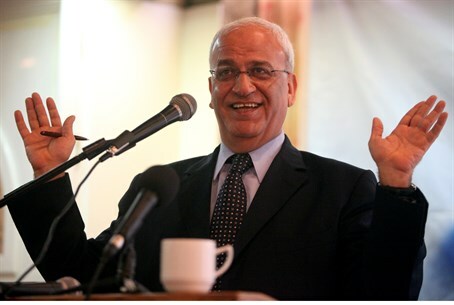 More statements have surfaced from Palestinian Authority (PA) chief negotiator Saeb Erekat's Thursday speech, in which in addition to threatening unilateral UN Security Council moves against Israel next month, he blamed Israel for the Hamas terror attack in Jerusalem on Wednesday. "We regret all loss of life. At the same time we reiterate that the Israeli occupation of Palestine remains the main source of violence and instability in the region," said Erekat in Ramallah. "Palestinian citizens continue to be oppressed, imprisoned, injured and killed by the occupation forces, with impunity and the full backing of the Israeli government." In the statements, reported by the Palestinian Arab Ma'an News Agency on Friday, Erekat also launched a verbal barrage on Prime Minister Binyamin Netanyahu. Netanyahu on Thursday said the attack the day before was supported by PA Chairman Mahmoud Abbas "who glorifies the murderers and also embraces the organization that they are part of, Hamas," a reference to the recent unity deal that torpedoed peace talks in April. However, Erekat turned the situation on its head, saying "by recklessly claiming that President Abbas is inciting terrorism, Mr. Netanyahu has turned his back on peace. He called the situation in east Jerusalem 'intolerable' without mentioning his government's recent provocations that have inflamed the political situation." Regarding Abbas's culpability, a senior aid to Abbas was quick to praise the terrorist murder of the three-month-old, calling the terrorist a "hero." Abbas and Erekat's Fatah faction likewise pledged "loyalty" to the terrorist baby killer on Thursday. Erekat nevertheless continued his tirade, saying "Mr. Netanyahu and his extremist government coalition continue to refuse the minimum requirements for peace, including acceptance of the two-state solution. Instead of pursuing peace, his government systematically violates international law in order to consolidate its apartheid regime in Palestine." As far as minimum requirements go, the PA led the last round of "peace talks" into the ground well before torpedoing them with the Hamas unity deal, refusing to recognize Israel as the Jewish state and breaching talk conditions and the Oslo Accords with unilateral moves by applying for international conventions. But for Erekat, Netanyahu was the only one to blame. "The man, once he looks at the mirror...should know who's responsible for the miserable situation of Palestinians and Israelis, the escalation of violence and so on," said the PA senior official. "He plants the seeds of desperation." Erekat has made a string of outrageous statements lately, equating the Jewish state with the Islamic State (ISIS) terror group last month, just days after claiming that 96% of the deaths in Gaza during Operation Protective Edge were civilians. Extensive studies have revealed that a full 49% of those killed were in fact terrorists, making an unprecedented 1:1 ratio of civilian to combatant ratios almost unheard of in urban combat.